A much-loved resident of Uptown has returned after two years away, and we couldn't be happier. 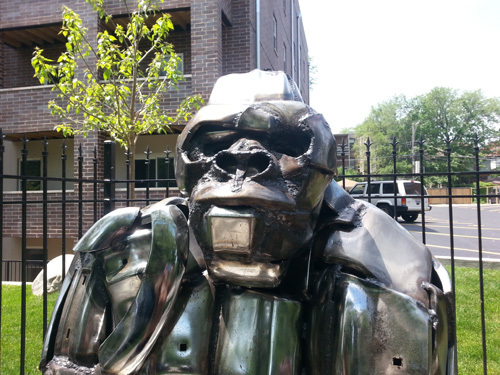 The Hull House gorilla, who sat outside of 4520 North Beacon for decades, was removed in 2013 during construction of the new apartment building on the property. Friday there was a re-dedication ceremony welcoming him back to his old home. 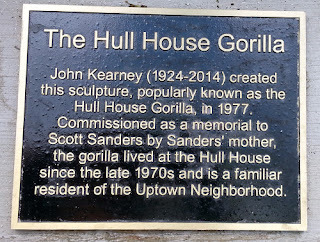 The gorilla was created in 1977, a commission by one of the Hull House staff in memory of her son, Scott Sanders. The artist was John Kearney, an internationally known sculptor who called Uptown home until his passing last year, just shy of his 90th birthday. 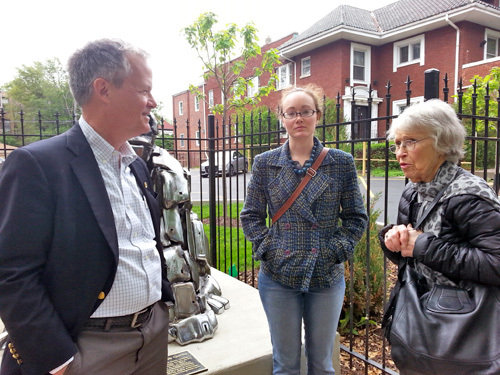 Mr. Kearney was also the artist who did the statues in Oz Park (the Tin Man in his signature style of welded metal), and the statues of cougars at Goudy School. He also created the much-loved Elaine Place giraffes. At today's re-dedication, Mr. Kearney's widow, Lynn, spoke of his love for Uptown, where she still resides. 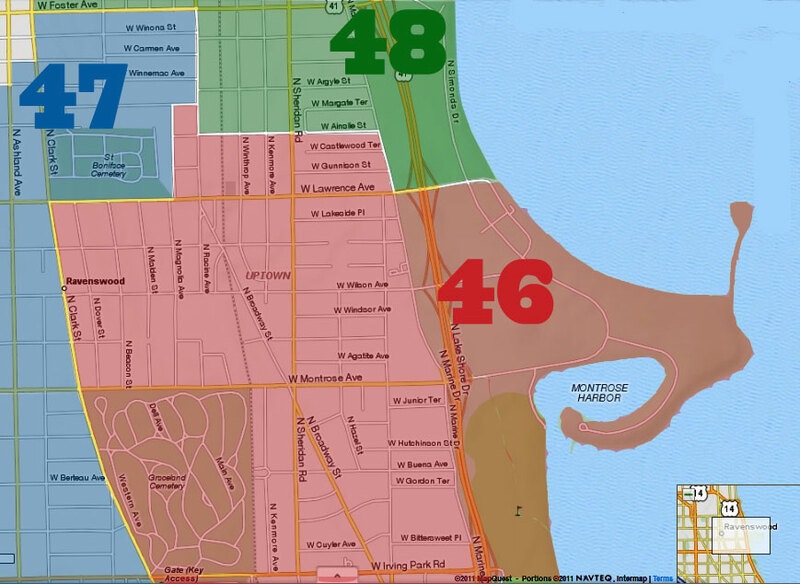 His eldest granddaughter, Samantha Kearney, an Edgewater resident, was also in attendance. Neighbors were there, including a woman who has lived on the block for 40 years and remembers when the gorilla was first installed. Mr. Kearney's assistant, John Keith, was there as well. He began apprenticing with Mr. Kearney while he was still a teenager, and ended up becoming his assistant for more than 30 years. 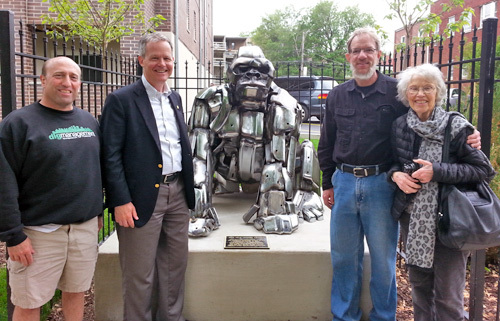 He helped create the gorilla in the 1970s, and then spent part of the past year rehabbing and restoring the sculpture in his South Loop studio. He took the piece apart, replaced the parts that had become rusty or weak, and then welded the gorilla back together again. Good for another four decades at least! 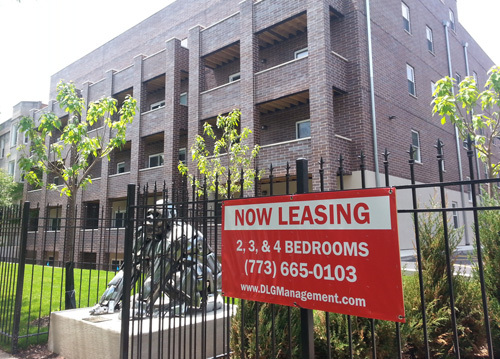 Dave Gassman, who bought the Hull House community center from the social service after it closed, became the gorilla's owner when he acquired the Beacon property. He said he has been told by many residents how they remembered growing up with the statue and climbing on it as children. He made the decision to keep it at its home based on the affection that so many in the community have expressed for it. He even made a cut-out niche and pedestal for it to ensure that it would remain accessible to the public. We are so grateful that he did. Look at the fate of Kearney's Elaine Place goat and giraffes: After the Lakeview property where they had stood for years sold, they were bought separately, put into storage, and now reside at the Racine Art Museum, where they are on loan through 2016. A similar fate could have been the gorilla's. 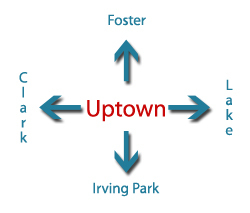 Instead, he remains in Uptown, and is accessible to anyone who wants to see him, sit with him, or even climb on him. Mrs. Kearney said it best on Friday: "I am so happy that the gorilla is staying in Uptown. And I know Jack is too."